Marvel has released two new featurettes for Black Panther that show the cast talking about their characters and the intense action in the movie. Black Panther has been hailed as one of the most anticipated movies of 2018 and is already breaking Marvel records for the most amount of presale tickets sold in 24 hours, leaving many fans out of luck for hopes of seeing the movie on opening night. Black Panther star Lupita Nyong'o wasn't even able to purchase the presale tickets when they first went online due some ticket servicing outlets crashing, much like The Last Jedi. The first of the new behind-the-scenes clips features the cast talking about their characters. Chadwick Boseman is shown first and reveals that T'Challa is in a unique position since he is a superhero and also a world leader. There's not many superheroes who are in that position, so it adds a different slant to the normal comic book movie. Michael B. Jordan highlights the action in the movie and says that it stands out from just about anything else out there, which can be attributed to the way that the armies move in sync. 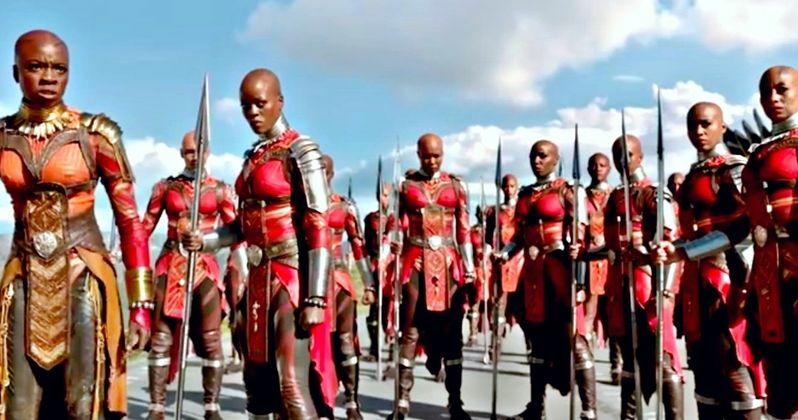 Danai Gurira plays Okoye who leads the Dora Milaje and also noted on the unique way that she leads the armies into battle, with everybody moving in sync. The next behind-the-scenes clip centers on Chadwick Boseman talking about being a king and how staying out of the spotlight is the Wakanda way. Black Panther was set up in Captain America: Civil War and Boseman states that the upcoming movie shows the character coming to terms with the death of his father while at the same time learning to become king and defend Wakanda. Director Ryan Coogler echoes the sentiment of staying in the shadows and out of the spotlight. Both clips show off some never-before-seen footage from Black Panther and they do exactly what they're meant to do, which is ramp up the excitement level. Marvel Studios' Black Panther follows T'Challa who, after the death of his father, the King of Wakanda, returns home to the isolated, technologically advanced African nation to succeed to the throne and take his rightful place as king. But when a powerful old enemy reappears, T'Challa's mettle as king, and Black Panther, is tested when he is drawn into a formidable conflict that puts the fate of Wakanda and the entire world at risk. Faced with treachery and danger, the young king must rally his allies and release the full power of Black Panther to defeat his foes and secure the safety of his people and their way of life. The Black Panther cast includes Chadwick Boseman, Michael B. Jordan, Lupita Nyong'o, Danai Gurira, Martin Freeman, Daniel Kaluuya, Letitia Wright, Winston Duke, with Angela Bassett, with Forest Whitaker, and Andy Serkis. The movie is directed by Ryan Coogler and produced by Kevin Feige with Louis D'Esposito, Victoria Alonso, Nate Moore, Jeffrey Chernov and Stan Lee serving as executive producers. Ryan Coogler & Joe Robert Cole wrote the screenplay. You can check out both of the featurettes below, courtesy of Marvel Studios' YouTube channel.